Whilst Swansea City are busy living the high life in the dizzying heights of the English Premier League, many other Welsh football clubs are famed both within the country and outside its borders. Perhaps the second most recognisable team is Cardiff City, who enjoyed a fleeting sojourn amongst the big guns in the 2013/14 Premiership campaign after a successive stint in the Championship. Aside from these two Welsh heavyweights, the following clubs deserve a mention for their respective honours and achievements. Founded in 1864, Wrexham is regarded as the oldest football club in Wales and indeed the nation’s birthplace of the modern game. Nicknamed the Dragons, the team play their home matches at the Racecourse Ground, which is credited as the oldest international stadium to still host international games. Wrexham’s achievements reflect their rich history, with 23 Welsh Cup victories, 3 FA Cup quarter finals, 5 FAW Premier Cup triumphs and a quarter final in the1975/76 European Cup. 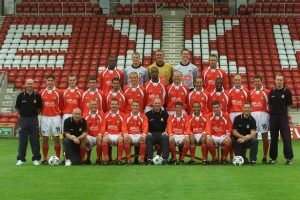 The Dragons currently compete in the 5th tier of the English division, after being relegated in 2007/08, bringing to an end 87 consecutive years in the Football League. Relatively unknown outside of Wales, the New Saints are the Welsh Premier League’s most successful side. Based in Llansantffraid, yet incorporating its neighbour town of Oswestry in Shropshire, this 60 year old club have won the title an unprecedented 12 times. This historic club has endured more trials and tribulations than any other Welsh football team. Dating back to the late 1800s, Barry Town enjoyed plenty of success in the early years and went on to dominate the league in the 1990s, winning a remarkable treble and recording a 51 match unbeaten run. This supremacy eventually came to an end in 2003 as the club went into administration and hit rock bottom. An epic fightback from supporters revitalised the club, returning Barry to their rightful place in the Welsh Premier League.